The following code saves the attachments from selected messages but does not delete the attachments from the message(s). This VBA code is based on the code sample from my Outlook book: Save and Delete Attachments. Use it if you want to save the attachment, add a link to the saved file, and delete the attachment from the message. Instructions to add the macro to a toolbar button or ribbon command are at the end of the page. To use it you must first create a folder under your My Documents named OLAttachments (the code will not create it for you). Then select one or more messages and run the macro to save the attachments. You'll need to set macro security to warn before enabling macros or sign the macro. You can change the folder name or path where the attachments are saved by editing the code. strFolderpath = strFolderpath & "\OLAttachments\"
This macro runs (automatically) on messages as they are added to the Inbox. Put it in ThisOutlookSession. This version of the macro works with Rules, saving all attachments in messages that meet the condition of the rule to a folder under the user's documents folder. To learn more about run a script rules, see Outlook's Rules and Alerts: Run a Script. If you want to add the message date to the file, you'll need to get the date from the SentOn or ReceivedDate fields then format it as a string before adding it to the file name. It's a total of 4 new lines and one edited line. To format the date and time and add it to the filename in 20130905045911-filename format, you'll add two lines of code after you count the attachments to get the date and format it, then edit the line that creates the filename. This macro saves all attachments, including images embedded in signatures (they are attachments after all). To avoid saving signature images, you have two options: don't save image files, or don't save smaller files. You could even do both and save only larger images files. Replace the code between For i = lngCount To 1 Step -1 / Next i lines with the following to filter out files smaller than 5KB. This should catch most signature images (and many text files). To work with a longer list of file types, use a Select Case statement. In this example, we're looking for image attachments, and if less than approx 5KB, we skip them. Larger image attachments will be saved. This macro merges the first macro on this page with the macro at Write the last used value to the registry sample to add a number to each saved attachment, incrementing as attachments are saved. Because the last used value is in the registry, the count will persist because restarts. sKey = "Last Index Number"
To save the attachments in subfolders, you need to use the File Scripting Object to create the folder if it does not exist. A complete, ready-to-use sample macro is here. strFolder = strFolderpath & "\OLAttachments\"
strFolder = strFolder & objMsg.SenderName & "\"
This version of the macro save the attachments on the selected message to a subfolder. By using a "stub macro" to set the name of the subfolder, you can don't need ot repeat the long macro multiple times to use it with different pre-defined folders. In this example, I'm either saving the attachment to From Bob or From Jim folder in my Documents folder. Create buttons on the ribbon for the stub macros. Select the message then click the appropriate button. strFolderpath = strFolderpath & "\" & strFolder & "\"
In Outlook 2007 and older, you can create a toolbar button to run the macro. In Outlook 2010, you'll need to customize the ribbon. 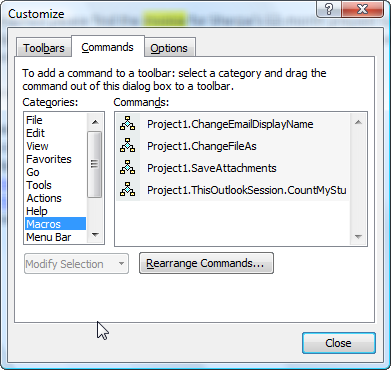 More information is at Customize the Outlook Toolbar, Ribbon or QAT and at Customizing the Quick Access Toolbar (QAT). Step 2: Choose Macro from the Choose Commands From menu and select the macro you want to add to the ribbon or QAT. Step 3: Select the Group you want to add the macro to. If it doesn't exist yet, use the New Group buttons to create the group. Step 4: Use the Rename button to give the macro a friendly name and change the icon. You are limited to the icons in the dialog (unless you want to program a ribbon command). To create a toolbar button for it, go to View, Toolbar, Customize, Commands tab. In the Categories pane, type M to jump to Macros. On the Commands side, drag the macro you created to the toolbar. Right click on the button to rename it and assign a new icon. My VBA Macros all stopped working today for no reason. I have tried every security fix that I have found on the internet and nothing works. What is weird is it acts like it is running but just doesn't do anything. Does anyone have a very simple macro that i can test to see if its my macros or if its outlook being weird? As the first line, add msgbox "It's working!" - if you see the message box, then the problem is with the code. Check for updates and install any then reboot - I've seen outlook act weird when updates are waiting to be installed. I am trying to combine a number of your scripts together but with no luck. I'm using the Save in sender folder but trying to add, in only down load, word, excel & PDF files, with the addition on a file number being remembered in the registry. Is that possible to add the clause so it can avoid saving the Statement Files? Is it possible to add message date to the end of the filename instead of at the beginning? I am trying to create a macro that populates a folder with all attachments in such a way that I can organize all of the files by the name of the document followed by the date received. you can, but you need to get the file extension so you can change the order. I have code one the site (somewhere) that does this. I am trying to use the script save attachments to hard drive, but i keep getting an error of "Activex component can't create object" . I am using MS outlook 2016, not sure if that has anything to do with it. This can be really handy for my line of work i get over 300 attachments a month and its a pain to drag and drop, any help would be nice. It works in Outlook 2016, although it might need tweaking if you use 64-bit office. Does it get to any line before stopping with that error? There isn't anything in the code that should trigger that error. When I debug, it highlights this line in yellow "strFolderpath = CreateObject("WScript.Shell").SpecialFolders(16)"
I know that's to grab the my documents section, I am on windows 10 and using Microsoft outlook 2016. My documents is linked to the network through my work, not sure if that's the problem. specialfolders(16) is the documents folder. it probably is because the documents are on the network. Outlook doesn't handle network paths well.
"' Instantiate an Outlook Application object. Set objOL = CreateObject("Outlook.Application")" and stop there. It's probably security issues - i've had issues with create object recently. as long as outlook is running (and it will be, since its an outlook macro), you don't need create.object. So what I did was instead of this line "strFolderpath = CreateObject("WScript.Shell").SpecialFolders(16)" , I ended up using the direct file path to my documents folder and I changed with your suggestion "Set objOL = CreateObject("Outlook.Application")" , to Set "objOL = Outlook.Application"
Thank you, this code works perfectly for me and is really useful! I'm using the first version of this code. I'm fairly new to VBA and am trying to automate naming based on the e-mail subject (e.g. : If e-mail subject is A, strFile = X; Else if e-mail subject is B, strFile = Y etc...). Do you have any methods/functions to suggest? (any ideas would be helpful and appreciated). Thanks a lot Diane! I'll look into macros, managed to get the If statement working though so I'm covered no matter what - thanks again! I am trying to combine the "Run a Script Rule to Save Attachments" and "Add the message date to the filename", but they do not had well together. Could you advise how to combine these? Also, how would I go about deleting the message after it has been saved to the folder with the proper name. For reference, I have the "Run a Script Rule to Save Attachments" working. I am using the ItemAdd version above but have it saving attachments to a Network folder. I have that working, I think. I would like to save only certain attachments and rename them so that the attachments are overwritten everyday. I tried to use an If statement with .Contains to identify the contents of the variable strFile and then change it to what I want but get an error. Any idea if I am even close to the right path? Any help would be appreciated. Thanks. searching in the document for a word is more difficult and i don't have any code samples that do it handy. how do I only save attachments from objects with subject "Example"? I would have to create an extra object for the mailitem I guess? No need to create a new object, just use that line after it checks for attachments (so you don't need to check every message for the subject and them for attachments).